One thing about traveling and visiting a decent amount of people, is that eating out is the thing to do. Everywhere with everyone. Which is delicious, but restaurant food is so heavy! So, now I’m down in California, house-sitting for my sister. And I’m taking the opportunity to eat veggies, oats, fruits, and small this and that, and hiking every day. Beginning to feel human again. Phew. I’m inspired by Anesu’s simple philosophy. I may put it on a T-shirt, or perhaps a Caterpiller D-9 bulldozer. Chris, you put a fair amount of thinking into drawing the background of each panel. I also reread previous strips to keep it fresh and to look for possible clues or Easter eggs. In the strip before this, in the first panel, the wall on the left side has the outline of a bird sitting on a large round object/egg. Was that just something random you drew or is it a clue to something you’ll include later in the story? 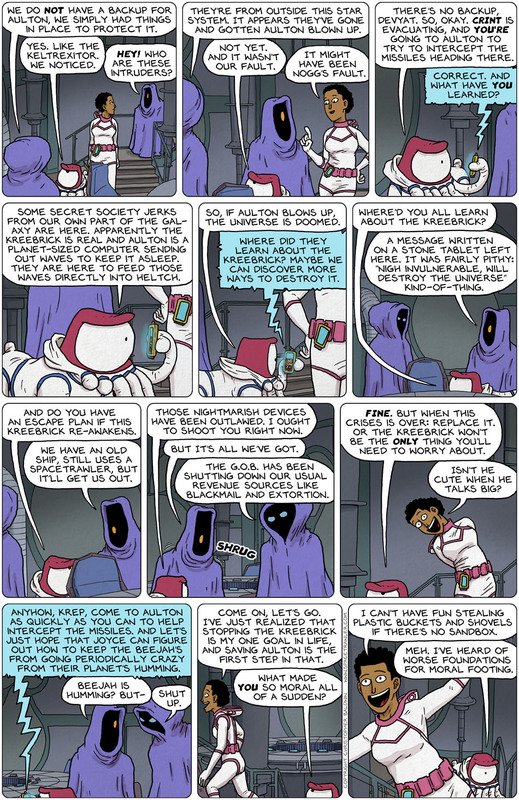 Your Spacetrawler and Dave Kellett’s Drive (which he maddeningly updates only once a week) are the only sci-fi Web comics that have consistently held my attention and that I *always* follow and reread. The fact that your story has so many twists and turns, the characters are so compelling and your artwork is superb AND coloured puts it top – which is saying something as I LOVE Drive! I hope the story you have planned for Spacetrawler goes on for a very long time. I don’t want it to end. You see a bird on an egg, I see half a bunny head. It’s Rorschach wallpaper! And to answer: oddly enough, it’s a round fruit. The thing on top is a a leaf. And I’m afraid it has no significance, except that i think it’s the type of “archaic” feeling imagery a secret society would have. That will surely come back around.